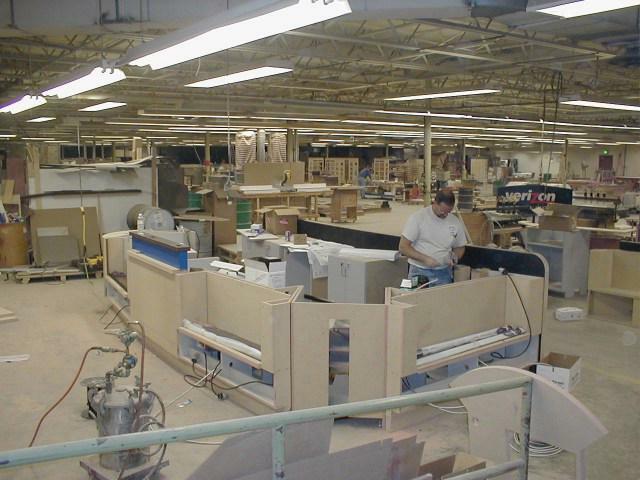 Generally, straight cuts are made using a conventional table or panel saw. A saw blade specifically designed for acrylic, such as a triple-chip grind, carbide toothed saw blade works best. For a 10-inch saw blade, 80 teeth are recommended. For larger blades, equivalent tooth spacing can be utilized with good results. On a triple-chip grind saw blade, every other tooth has a beveled cutting edge, which aids in chip removal and reduces heat buildup. When cutting ACRYLITEe SG sheet, the blade should protrude d” x 1” above the surface of the sheet, with optimum results usually obtained using a e” blade height. Vibration should be kept to a minimum, either by clamping the sheet to the cutting surface (when operating a vertical saw or panel saw) or providing the proper pressure on a table saw. Moderate feed rates, in the 15-25 ft/min range, will ensure a proper cut. A chipped edge indicates that the feed rate is too slow. It is recommended that the feed rate be decreased at the end of the saw cut, especially on thinner sheets. This will prevent chipping and blowout of the exit edge. Hand held jigsaws work well with ACRYLITEe SG sheet in cutting intricate shapes and letters. Results comparable to those achieved with cell-cast acrylic sheet are possible. For best results, use a wavy-set type blade with 8-13 teeth/inch (tpi). This blade configuration will typically chip cell-cast acrylic, but will work very well with ACRYLITEe SG sheet due to the sheet2s inherent toughness. Using a blade with a higher number of teeth per inch, 18-24 tpi, may result in melting along the cut edge of ACRYLITEe SG sheet. It is also important to ensure the blade is sharp - do not use a blade that has already been used for cutting metal or other materials. In jigsaw cutting, it is important to minimize vibration by clamping the material to a firm surface. Feed rates in the 8-12 ft/min range will yield the best results. Bandsaws are typically used for quick, rough cuts, as well as intricate shapes and letters. As with jigsaw cutting, the quality of the edge is dependent on the type of blade used. Generally, blades in the raker style with teeth in the 18-24 tpi range will produce the best results. Blades with fewer teeth per inch will leave a jagged, rough edge while blades with a higher number of teeth per inch will yield a smoother edge. If blades with more teeth per inch are used, it is recommended to utilize a coolant such as water, compressed air, or a combination of both to reduce melting along the cut edge. Feed rates in the 10 to 15 ft/min range will yield the best edge. ACRYLITEe SG sheet can be scribed and broken similarly to ACRYLITEe FF sheet and ACRYLITEe GP sheet. Scribing should only be done on the 0.118” (3mm) thickness. With the aid of a straight edge to guide the scribing tool, pull the scribing tool across one side of the sheet surface several times until the tool has penetrated approximately 1/16” through the material. Next, position the sheet so that the scribed line is just beyond the edge of the working surface. While holding the sheet firmly in place on the surface near the scribed line, apply a quick, downward pressure to the end of the sheet overhanging the working surface. In general, ACRYLITEe SG sheet is a more forgiving material to rout than ACRYLITE FF acrylic sheet or ACRYLITEe GP cast acrylic sheet. Due to its proprietary formulation, ACRYLITE SG sheet is less prone to chipping, and permits faster feed rates without sacrificing edge quality. Carbide tipped, d” diameter bits, with two flutes will yield the best results. In all routing operations, from hand routing to stationary equipment, minimizing sheet vibration will help to reduce or eliminate chipping. Vibration can be minimized by using sufficient hold-down for stationary routing, and a guide when hand routing. CNC routing is fast gaining in popularity because it offers fabricators high productivity, reproducible results and excellent quality. When using a CNC router, two flute, spiral up bits, d” in diameter or greater, are recommended. These bits will be less susceptible to frictional heat build-up than smaller diameter bits in the 1/8” to 3/16” range. ACRYLITEe SG sheet can be easily drilled with the same equipment used for ACRYLITEe FF or ACRYLITE GP SHEET. It is best to use stationary drilling equipment such as a drill press. The proprietary formulation of ACRYLITEe SG sheet provides excellent resistance to chipping when drilling. In general, it will drill faster and more easily than standard acrylic sheet. Best results are achieved using high-speed steel 3modified-for-plastic” drill bits. Instead of the relatively flat tip angle of 120º present in a standard metal drill bit, a modified for plastic drill bit should be ground to a sharp 60-90a. The sharp angle allows the bit to easily enter and exit the material. The cutting edge should be ground flat to a 0-4º positive rake angle, which allows the cutting edge to scrape the material, not gouge it. The surface behind the cutting edge must be ground away to a 12-15a-clearance angle, which minimizes metal to plastic contact and heat build-up. Rotational speeds in the 500-1000 RPM range, combined with feed rates in the 3-12 in/min range, will produce a clean, low-stress drill hole. If a 3modified-for-plastic” drill bit is not available; a standard metal drill bit can be used to produce satisfactory results. Under these circumstances, it is extremely important to securely clamp the material to the table, to minimize chipping. The same edge finishing operations that work well with standard acrylic sheet can be used to obtain excellent edge finishes with ACRYLITEe SG sheet. However, care must be taken in certain edge finishing operations, such as flame polishing, to ensure the best edge quality. This section will cover proper techniques to ensure an edge finish of the highest quality. Wet sanding will yield a smooth, matte-finish edge and is suitable for use prior to flame polishing. Dry sanding is not recommended, as it will lead to a highly stressed and melted edge. To obtain the smoothest edge, start with 240-grit 3wet and dry” sandpaper, using plenty of water. The use of water will keep edge stresses to a minimum by acting as a coolant. Finer finishes can be obtained by sanding with 240 grit, then stepping up to 400, 600, and 800 grit, depending on the desired finish. The use of belt sanders may result in melting and high stress. If using a belt sander, it is important to use light pressure when sanding. Excessive pressure will increase frictional heat buildup, causing the edge to melt and gum. Hand scraping is an alternative to sanding for preparing the edges of a sheet for polishing. The sheet can be scraped with almost any type of sharp, flat metal edged tool. Holding the scraper vertically, at a 45º angle to the edge, scrape the sharp edge of the sheet by drawing the tool across the edge with a firm but steady pressure. A continuous strip should peel as the tool is drawn along the edge. There are tools available that will reduce the sharpness of both edges at the same time. It is important to note that scraping will not provide the smoothness of a sanded or polished edge. Jointing of ACRYLITEe SG sheet will produce a smooth, machined edge. Knives made from high-speed steel or carbide will work well. Blade height should be set to remove approximately 1/32” from the sheet. The most important aspect of jointing is controlling the feed rate. It is important to use a steady, even feed rate while holding the sheet material firmly to the guide fence. Excessive feed rates will result in a chipped, highly stressed edge. Commercially available edge finishing machines offer a fast method of obtaining smooth edges without sanding or scraping. Finishes will range from smooth, matte-finish to almost polished edges, depending on the design of the machine and cutting tools used. Edge finishing machines are ideal for preparing sheet for subsequent edge finishing steps, such as flame polishing and buffing, or fabrication steps such as cementing. Care should be taken to adjust the feed rate to eliminate chipping and melting of the material. Fast feed rates will result in chipping while slow feed rates will result in melting. In general, faster feed rates can be used for edge finishing ACRYLITEe SG sheet than for standard acrylic sheet. Buffing the edges of ACRYLITEe SG sheet will produce a high luster finish. It is recommended that the edge be scraped, then wet sanded prior to buffing. A stationary buffing wheel or portable polishing head can be used. Loose stitched, bleached muslin wheels, used in combination with a medium to fine buffing compound will provide a high luster edge in a short time. Highly polished edges can be obtained by flame polishing using the same techniques used with standard acrylic with slight modifications. When flame polishing ACRYLITEe SG sheet, a cooler flame should be used than with standard acrylics. This is best accomplished using MAPP gas. Another option is to use a hydrogen/oxygen-welding torch. Make sure to reduce the oxygen content to produce a flame that is bright orange/red in color, as opposed to the bluish, almost invisible flame typically used with standard acrylics. ACRYLITEe SG sheet has a tendency to turn a milky white color when overspray from the flame contacts the surface of the sheet. It is important to minimize this contact by using a quicker feed rate than would normally be used for standard acrylics. Hold the torch at an angle and draw the flame along the edge of the sheet. Practice will help you to estimate the speed and distance. If the first pass does not produce a completely polished edge, allow the piece to cool, then try a second pass. For optimum edge finish, wet sand the edge or pass the sheet through an edge finishing machine or jointer to remove any tooling marks from previous operations prior to flame polishing. ACRYLITEe SG sheet can be easily and quickly cemented to itself, other acrylic materials, as well as to trim cap, creating strong bonds in applications such as channel letters. ACRYLITEe SG sheet offers faster setup times than cell-cast acrylic sheet products. Acrylic cements such as Weld-On #3 or Weld-On #5 work well on ACRYLITE SG sheet. Generally, techniques used to cement standard acrylics can be used with success on ACRYLITEe SG sheet. When making channel letters, make sure all areas are in contact with the trim-cap, and apply a generous amount of cement around the perimeter of the letter. For additional strength, a bead of viscous cement such as Weld-On #16 can be applied to the perimeter of the letter. Edge finished, jointed, or clean saw-cut edges will yield the best results. Avoid cementing sanded or scraped edges because these operations tend to round the corners of the edge, leading to inconsistent surface contact and air bubbles in the joint. NOTE: Never cement flame polished edges. This operation creates high levels of internal stress in the material and could lead to crazing. Due to its formulation, ACRYLITEe SG sheet tends to absorb more solvent cement than standard acrylic sheet. To compensate for this, make sure to apply a liberal amount of cement to the joint. This can be accomplished by tipping the vertical piece about 1º so that more cement flows into the joint. Alternatively, 0.002” shims can be used to elevate the vertical piece slightly. Shims should be removed after 45-60 seconds. SecondsInitial setup time will vary between 5-60 seconds, depending on the type of cement used and the shop environment. The following table illustrates the 3tack” time for various cements. For this experiment, the 3tack” time is defined as the amount of setup time required before a 3T” joint can be picked up by hand without failure of the joint. The following recommendations apply to edge finished edges, and should be used only as a guide. Try adding acetic acid in small concentrations (3-5%) to slow the rate of evaporation of the cement. For optimum strength, bonds should be allowed to set up for 10-15 minutes before moving, and 24 hours before subsequent fabrication steps are performed. High bond strength will be achieved after 24-48 hours, and bond strength will continue to increase for several weeks. ACRYLITEe SG sheet can be easily painted and silk-screened using the same paints and techniques as ACRYLITEe FF and ACRYLITEe GP sheet products. However, some paints, due to their brittleness, may result in lower overall impact strength. Paper masking may leave a latex residue on the sheet. This residue can result in poor wetting of the paint on the surface of the sheet and poor paint adhesion. If this is a problem, clean the surface of the sheet prior to painting using a diluted mixture (50% or less) of isopropyl alcohol in water. Rinse thoroughly with water and dry using a soft cloth or chamois. Particles on the surface of the sheet can also cause adhesion problems. Therefore, it is important to remove dust and particles on the sheet surface by neutralizing static charge using an ionized air gun. Leaving the masking on the sheet or using a removable spray-on maskant may help to minimize exposure to overspray. It is important to note that the overall impact strength of a painted sheet may be lower than that of an unpainted sheet. This is due to the lower impact strength and tensile strength of the paint itself. The actual impact strength reduction will depend on the paint used. The following table illustrates the Gardner Impact values before and after painting. Spray and screen paints can be removed using recommended paint removers. To reduce the chances of crazing the surface of the sheet, minimize the amount of time ACRYLITEe SG sheet is in contact with these solvents. (914) 699-3030Even with the complete removal of paint from the surface of the sheet, a phenomenon referred to as 3ghosting” often occurs. A hazy outline of the original images may remain and become visible upon application of new paint. ACRYLITEe SG sheet can be thermoformed into a variety of finished parts and sign faces. Its forming temperature range of 270-350aF offers faster cycle times than can be achieved with conventional cell-cast acrylic sheet. This wide range of forming temperatures allows for greater versatility in thermoforming operations. In most cases, excellent results can be achieved using forming temperatures of 310-320aF. (Up to draw ratio of 3:1) Parts that contain more detail or have a deep draw need to be formed at the high end of the forming range, 320-350aF. Parts should be left in the mold after forming until they have reached a temperature of approximately 160-180aF. It is important to preheat the mold to approximately 160-180aF. If the mold is not preheated, the formed part will cool too quickly, resulting in internal stresses in the thermoformed part. Draft angles of 2-3º will allow for easy part removal. Due to its method of manufacture, ACRYLITEe SG sheet will be oriented in the manufacturing direction. Manufacturing direction can be determined by looking at the label or printed masking on the sheet. As you read the label or masking, the manufacturing direction is from top to bottom. The sheet may shrink up to a maximum of 3% in the manufacturing direction when heated. Be sure to allow for shrinkage when cutting blanks for thermoforming. During the heating cycle, colorless ACRYLITEe SG sheet will turn a translucent white color. After the sheet is formed and allowed to cool to room temperature, it will regain its high light transmission, losing its milky white appearance. ACRYLITEe SG sheet can be heated by a variety of methods, including infrared heaters, circulating air ovens, and other conventional heating methods. Generally, when heating ACRYLITEe SG sheet in an air-circulating oven, the heating times will be similar to ACRYLITEe FF sheet. Heating cycles when using infrared heaters tend to be much shorter than oven heating cycles. The following table illustrates approximate heating times for 0.118” (3mm) ACRYLITEe SG sheet. Testing was done on a thermoformer equipped with ceramic heaters positioned approximately 2.5 to 3 inches above the sheet. It is important to note that actual times will vary for each individual thermoformer due to various parameters such as the type of heater (convection oven, radiation, etc. ), distance from the sheet, and single or dual side heating. Temperature (aF)120 Seconds260a180 Seconds310a210 Seconds350aACRYLITEe SG sheet also offers outstanding thermoforming definition at reduced cycle times, compared to standard acrylic and polycarbonate sheet. ACRYLITEe SG sheet can be easily line bent using standard bending equipment. Line bending should be performed when the core temperature of the sheet is in the range of 270-290aF, which is slightly lower than line bending temperatures for extruded acrylic sheet and much lower than line bending temperatures for cell-cast acrylic sheet. As a result, shorter cycle times can be expected with ACRYLITEe SG sheet. It is important not to bend ACRYLITEe SG sheet at temperatures lower than 270aF because this leads to high internal stresses. These internal stresses can lead to crazing of the material should it come in contact with incompatible solvents or aggressive chemicals. ACRYLITEe SG sheet has a manufacturing direction. Looking at the masking label identifies this direction. As you read the 3ACRYLITEe SG sheet” label from left to right, the manufacturing direction will run from top to bottom. On longer line bends, i.e. greater than 36 inches, a slight warp or bow across the sheet may be evident. Orienting the bend so that it is perpendicular to the manufacturing direction can reduce this effect.